Henry Darger – loudlatinlaughing – Euge! Euge! The first book was Michael Bonesteel’s Henry Darger: Art and Selected Writings from 2000, which includes Bonesteel’s great essay “Henry Darger: Author, Artist, Sorry Saint, Protector of Children.” This recounts Darger’s childhood (sent to an asylum for feeble-minded children at age 12, there when one of the inmates tried to castrate himself and died 4 days later) through decades in Chicago working as a dishwasher and making art and writing and going to Mass 3 or 4 times a day. The rest of the book includes selections from Darger’s writing: Realms of the Unreal (“the reason the story runs so much with little girls as the actual heroes in this warfare is because, under most circumstances, women are braver than men”), The History of My Life, Book of Weather Reports, and his diary. In this book Bonesteel informs us that Darger pronounced his name with a hard G like Berger. 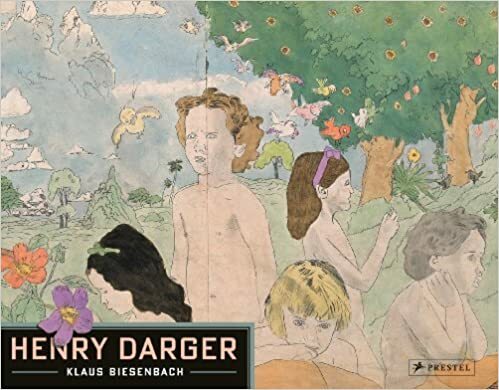 The second book was Henry Darger, edited by Klaus Biesenbach, including another essay by Bonesteel. This was almost 6 pounds of glossy reproductions of Darger’s work, including several pages of his History of My Life, which fittingly ended with “There is one really important thing I must write which I have forgotten.” Definitely a must-read for anyone who is even slightly interested in Darger.